Currently leads the Tony Barron Orchestra (dance band). Maintains a busy playing schedule performing with local and area jazz big bands / combos and traditional jazz groups, plus freelancing and teaching. Member ITA and AFM. Irvin L. Wagner is a faculty member at the University of Oklahoma where he is holds the distinguished titles of David Ross Boyd and Regents Professor of Music. At the University he teaches trombone as well as serves as the Coordinator of Graduate Studies and Music Director and Conductor for the Music Theater. Bass trb, Abilene Philharmonic Orchestra and free lance Tenor Trb, Abilene, Texas. Born and based in the Dallas area, Greg has forged a wide ranging list of playing credits to his resume. While attending the U of North Texas, he played in the One 'O clock lab band. He graduated with Bachelor and Master degrees in jazz studies. He is a veteran of the US Army band (West Point Jazz Band). Bass trombone and tuba, retired in 2002 from the Los Angeles studio scene and now lives in Florida. Don is originally from North Carolina and holds a degree in music from Stetson University in Florida, where he studied with Donald Yaxley, and a MA from Catholic University in Washington, D.C. Originally from Bytom in Poland, Maciek Walicki was born into a musical family. He begun his training on the violin at the age of five with his violist mother. After switching to trombone he finished high school in the class of Pawel Waloszczyk in 1995 and went on to study in The Frederyk Chopin Music Academy in Warsaw in the studio of Roman Siwek, Principal Trombone of The Polish National Philharmonic. Two years later in 1997 Mr. Walicki got invited to continue his studies with one of the most sought after soloists and educators Prof. Jonas Bylund in The College of Muisc and Theatre Hannover in Germany, and in 1997 after succesful audition Maciek entered on the full scholarship The Juilliard School in New York City where he studied with the distinguised Joseph Alessi, Principal Trombone of The New York Philharmonic. Born 5/29/52 in San Francisco, CA San Francisco State Performance Major Private study with Julian Priester, Bobby Hutcherson and Will Sudmeier La Escuela Nacional in Havana Cuba. Since 1991, Brent Wallarab has been lead trombonist with the Smithsonian Jazz Masterworks Orchestra, the jazz orchestra in residence at the Smithsonian Institution's Museum of American History in Washington, DC. Award Winning Composer/Arranger, Olympia, WA A product of the Seattle schools, Norman Wallen began his professional playing career in the late 60s, and performed as a sideman with dozens of high profile professional entertainers. A graduate of Central Washington University. Tom Walsh, Trombonist.Composer.Digital Sampler. Tom Walsh began his 'musical voyage' as principal trombone in an orchestra at sixteen. Tom has since performed and/or composed popular or improvisational music for such Canadian artists as Steven Barry, Jane Bunnett, Pierre Cartier, Michel F. Coté, to mention a few. Melvin F. Wanzo, born in Cleveland, Ohio, November 22, 1930, is a big band Jazz Legend, who has served as a mentor for the Wayne State University Trombone Ensemble from 1997 through 2002 and for the Jazz Lab I Band since 2000. He and his wife, Carolyn Patrick-Wanzo, a graduate of Wayne State University's School of Social Work, are currently living in Detroit, Michigan. Craig was born and raised in Chicago, and moved to the L.A. area to continue his education at Azusa Pacific University. While there, he began his career as a free-lance bass trombonist, tubist, arranger, orchestrator and copyist. Craig is also playing in Gordon Goodwin's : Big Phat Band. Lead Trombonist, Olliephonic Horns, Little Big Band, Waimea/Kamuela, Hawaii . Professor of Trombone at the University of Kentucky since 1983, Dale Warren maintains an active performing schedule. As a performer he has soloed twice with the Boston Pops Orchestra (as winner of a Boston Pops Concerto Competition) and performed as Principal Trombonist with the National Orchestra. Chris Washburne is one of those rare musicians whose musical activities cross many styles and cultural borders. From early in his career he refused to be pigeon-holed as just being a jazz or classical player, but instead has continually pursued a diverse path. Chris is currently freelancing as a studio musician. John Wasson (b. 1956) was raised in St. Paul, Minnesota. He showed an early affinity for music by plunking out tunes on the piano during his pre-school years. He was first introduced to professional musicians courtesy of an elementary school concert by the Woodwind Quintet from the St. Paul Chamber Orchestra. 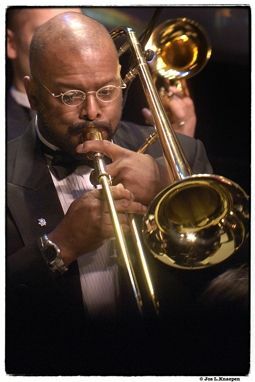 Reggie Watkins was born and raised in West Virginia and has played trombone for eighteen years. After attending West Virginia University for Music Performance he moved to Pittsburgh, Pennsylvania to become a staple on the music scene. There he began playing and recording with various groups. 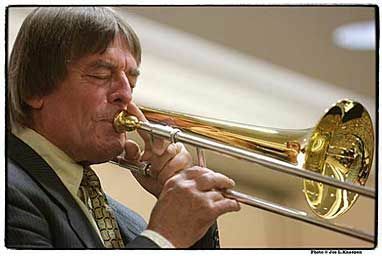 One of the finest bop-oriented trombonists of the past 30 years, Bill Watrous has had a low profile since moving to Los Angeles in the 1980s despite remaining quite active. Possessor of a beautiful tone and remarkable technique. Studied under Winson Hinkle (Florida Symphony Orch. )and Joe King (Las Vegas, Sam Rivers RivBea Orch). Currently performing with The legendary J.C.'s (high energy Soul/blues), Bughead (rock, Reggae, Funk), to mention a few. New Orleans trombonist and Yamaha Artist Harry Watters serves with the Army Blues Jazz Ensemble and is the newest member of the United States Army Brass Quintet in Washington, DC. Gene Watts is the original creator behind the Canadian Brass. When the idea came to him in 1970, he had already carved out an orchestral career with orchestras in North Carolina, San Antonio and Milwaukee. Mark Weaver (tuba/trombone) has been playing low-brass instruments since 1970, and is involved in numerous creative music projects across the western US. He performs records and composes music as leader/co-leader of Protuberance 'rough jazz trio', the MAD trio and quartets, and BRASSUM. Resident Lead Trombone with the Empress Ballroom Orchestra (Blackpool) for thirty years; Lead trombone with Radio & Television Orchestra from 1964 -1974 Worked with various international artists such as Matt Munro, Shirley Bassey, Tony Scott, Northern Dance Orchestra, Eric Delaney Big Band, New Geraldo to mention a few. Education Ed.D., Education, Boston University, 1987 M.M., Music Performance, University of Massachusetts, 1970 M.S., Education, Gorham State College, 1968 B.S., Music Education, University of New Hampshire, 1964 Areas of Interest he has spent much of my career conducting college ensembles. Jamie Wehr began studying the piano at the age of ten and upon enrollment in junior high school he began playing the trombone. He continued his studies with Roy Pickering at the University of Central Florida where he received the B.A. degree, with Betty Glover at the College-Conservatory of Music. From playing in the Sahara Desert, just North of Timbuktu, with Roswell Rudds Trombone Shout Band (2004), to creating music in a grain silo at an artist colony in upstate New York, to traveling all over the world with Frank Sinatra (1987 - 1994); to mention a few. 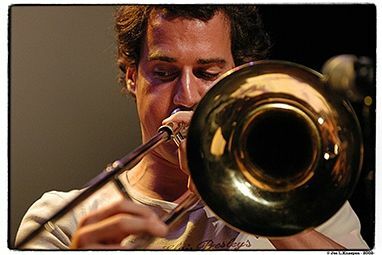 Jon Welch is an American trombonist, composer, arranger and producer who makes his home in Hamburg in northern Germany. As a trombone player he has performed and recorded with the North German Radio Big Band, Chet Baker, Joe Pass, Al Cohn, Kenny Wheeler, Clark Terry, Gary Burton, Michael Gibbs, Paquito D'Rivera, Bobby McFerrin, Jiggs Whigham, Howard Johnson, Phil Wilson, Herb Geller, Albert Mangelsdorff, Klaus Doldinger, Benny Golson, Vinnie Colaiuta, Pee Wee Ellis, Dusko Goykovich, Steve Gray, Colin Towns, Nils Landgren, Dave Weckl, Robben Ford, Nils Wogram, Slide Hampton, Nils Gessinger, James Last, Roger Cicero and Stefan Gwildis. Paul Welcomer was born in 1962 in West Chester, Pennsylvania. He joined the San Francisco Symphony in 1993 and currently holds the second Trombone position. Mr. Welcomer studied Trombone and received his Bachelor of Music at the Eastman School of Music under John Marcellus. Trombonist Angela Wellman, hailing proudly from Kansas City, Missouri, has performed with the McCoy Tyner Big Band, Joe Williams, Al Grey, Slide Hampton and other noted musicians. Ms. Wellman is a graduate of the Eastman School of Music where she received a Masters degree in Music Education. Wayne Wells is Associate Professor of Trombone at the Shenandoah Conservatory in Winchester, Virginia, USA. Mr. Wells has also held positions at the University of Kansas, and Towson University. He is a former member of the Annapolis Brass Quintet, America's first fulltime brass quintet. One of the more adventurous trombonists of the swing era, the distinctive Dicky Wells was somewhat innovative, playing his horn in a speech-like style filled with a great deal of color, humor, and swing. Although he came to fame with Count Basie in 1938, Wells had been a major-league player for a decade before that. After moving to New York in 1926, he recorded with Cecil Scott (to hilarious effect on "In a Corner") and Spike Hughes. Jens Wendelboe Trombonist, Composer, Arranger, Conductor, Instructor EDUCATION Manhattan School of Music. New York, N.Y. Master in Composition and Film Scoring, 1985 Ostlandske Music Conservatory. Oslo, Norway. Bachelor Degree - Classical Trombone, 1979 Individual Study with Don Sebesky (Film Score), and many more. Paul Weschke (1867-1940) was taught trombone by his father. His career began in 1885 as a military musician. When he was posted to Oldenburg in 1891, he also worked as first trombonist in the orchestra of the Hoftheater Schwerin in Mecklenburg. In 1895, he joined the Königliches Hoftheater in Berlin (now the Staatskapelle) as solo trombonist and played in the orchestra until 1929. Best known for his work with James Brown and the JBs, Fred Wesley has built his career in funk and jazz. From 1968 through 1975, Wesley was music director, arranger, trombonist and a primary composer for Brown's band, helping to create a funky sound that's heard in much of today's popular music. Born in Oslo in 1947. Well known Norwegian musician, conductor, arranger and composer. He studied trombone with Paul Kristiansen in Oslo and has been member of several norwegian bands and orchestras: The Big Band of the Norwegian Broadcasting Corporation, Oslo Philharmonic Orchestra, to mention a few. One of the most highly regarded trombonist of his generation, Ron Westray continues to expand upon the legacy set before him. Rons work as an instructor, mentor, recording artist and leader, has earned him world-wide recognition. Ron is perhaps best know for his work as lead trombonist in the Lincoln Center. Michael was a member of the band at Scott Air Force Base in Belleville Illinois, outside of St Louis and ultimately won the position as Bass Trombonist and Copyist with the United States Air Force Band in Washington, DC under the command of the legendary Colonel Arnald D Gabriel. 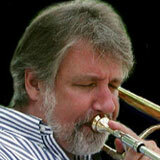 Jiggs Whigham is an internationally acclaimed trombonist, band leader and educator. This versatile performer, born Oliver Haydn Whigham III (the nickname Jiggs was given by his grandfather) in Cleveland Ohio on 20 August 1943, first came to the attention of critics and fans at 17, as featured soloist. Trombonist Jonathan Whitaker is Assistant Professor of Low Brass at Henderson State University in Arkadelphia, AR. Whitaker has also completed his doctoral coursework at Indiana University where he served as Associate Instructor of Trombone from 2001-2004. Kenneth M. White, Euphonium and Trombone A graduate of Williams High School in Burlington, N.C., Mr. White holds a B.S. in Music Education degree from Western Carolina University and a Master of Arts in Music degree from Appalachian State University. He received a bachelor's degree from Sam Houston State University in trombone performance under Dr. Henry Howey and a master's degree from the University of Houston under Mike Warny, trombonist with the Houston Grand Opera and Ballet Orchestra. Trombonist. joined Royal Navy in 1970 and joined the band to get out of other duties. Was convinced that the band already had enough drummers and asked to select a brass instrument. He chose a sorry looking brass pea shooter and commenced a love affair with the most beautiful musical instrument in the world. Emily White (trombone) was lured into the brass world by the inspiring teacher at Wells Cathedral School, Alan Hutt. She was then led further into the woods by Sue Addison while studying at the Royal Academy of Music and became entranced by the sackbut. Scott Whitfield (trombonist, composer, arranger, and vocalist) is rapidly gaining international recognition for his work with contemporary big bands, including the Toshiko Akiyoshi Jazz Orchestra and the new edition of Johnny Griffin's Big Soul Band, as well as his own Scott Whitfield Jazz Orchestra. Graduate of East Central University in Ada, Oklahoma with a Bachelors of Science in Music Education. Currently pursuing a masters degree in trombone performance at the University of Oklahoma. Peformed with the East Central University Wind Ensemble, University of Oklahoma Wind Symphony, Pride of Oklahoma, to mention a few. Denis Wick was Britain's most influential orchestral trombonist in the middle of the 20th century. He is also an internationally respected brass teacher and designer of brass mutes and mouthpieces. On retirement in 1989 he was awarded the International Trombone Association's annual award. Nat Wickham is Professor of Music, Trombone and Euphonium. A versatile performer and experienced teacher, his work as a classical and jazz soloist, recording artist, clinician, and adjudicator, has led to performances throughout the United States, Canada, and Europe. Currently, he is principal trombonist with the Greeley Philharmonic Orchestra and lead trombonist in the Colorado Jazz Orchestra. Regan lived in the Los Angeles area for many years, working as a free-lance trombonist and studio instructor. After long stints performing in both Japan and Hong Kong, he and his wife are currently living in Bangkok, Thailand where Regan is Director of Instrumental Music at International Community School. Studied with Bass trombonists Craig Ware (Azusa Pacific University), Robert Sanders (California State University Fullerton). Bass/tenor Trombone with Hour of Poiwer Orchestra (20years). Jazz Pacific Orchestra. Leader Newport Brass Quartet. President Bones West (Boneswest.org). Member St. Andrews Brass. Stan Kenton (1956), Woody Herman (1957), Ray Bloch (1967), recordings with Maynard Ferguson, Woody Herman, Clive Nelson, and Quincy Jones. Johnny Haig Orchestra (1979-81). Larry Wiehe, a military band soloist, was an outstanding performer in the style of Arthur Pryor and was known to dazzle his audiences with amazing virtuosity and technique. He spent much of his professional playing career in the military as trombone soloist with the United States Navy Band from 1951 to 1963 and the United States Air Force Band from 1963 to 1978. Renowned jazz trombonist Wolter Wierbos has been active in the Dutch creative jazz music scene since 1979, best known, perhaps, as a member of the ICP Orchestra, despite the number of bands he's played in. Skilled equally (and abundantly) in both technical ability and improvisational creativity. Trombonist/composer/educator. 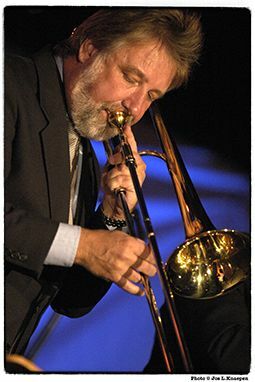 Arabesque recording artist, Steve Wiest is in constant demand as a jazz trombone soloist, lead player, composer/arranger, and educator. His recent project for the Arabesque Jazz label is titled The Steve Wiest Big Band: Excalibur. Released on August 28, 2006. Vaughn Wiester's performance experience began in high school under the tutelage of Robert H. Bechtel. While in high school, he played and arranged for the Riley Norris Band. After a hitch as a navy trombonist, Vaughn Wiester came to Columbus in 1968 to attend Ohio State University and to join the Dave Workman Blues Band. Equally comfortable performing in a variety of musical mediums, Stan Wilkerson continues to solidify his place alongside some of this generation's truly significant artists. Blessed with the unique ability to perform at the highest musical level of various genres. Ron Wilkins resides in San Antonio, Texas and is a graduate of Theodore Roosevelt High School. He attended North Texas State University (now the University of North Texas) and later graduated from the University of Texas at San Antonio. While attending NTSU, Ron performed with the 2 o'clock Lab Band, and many more. His father taught him the valve trombone. After enrolling in the Manlius Military Academy in 1918, he changed to the slide trombone. He quit the Manlius Academy in 1920 to begin his professional playing career, joining the Al Deisseroth Orchestra in Syracuse, NY. After a stint with Tige Jewett in 1922, he joined Bob Causer's Big Four later that year and stayed with this group when they became Paul Newell 'Spiegle' Willcox Spiegle worked with the Lakeside Park Band in Auburn, NY in 1925, and he then played briefly with in the California Ramblers before Joining Jean Goldkette in October of that year. Appointed Principal Trombone of the Atlanta Symphony Orchestra in 2003, Colin Williams joined the faculty at Kennesaw State University in 2004. Prior to his arrival in Atlanta, he played three seasons as Principal Trombone with the San Antonio Symphony. Jeffrey Williams, Professor of Trombone, takes on new duties as Associate Dean for Undergraduate Studies. Jeff has been teaching at the School of Music since 1980. The undergraduate office suite is now located in SOM 140, accessed from the main hall near the student lounge. Roy Williams was born in Salford, Lancashire in 1937 and began his career during the trad jazz boom of the '50s. His influences on trombone included Urbie Green and Jack Teagarden. He made his name as the regular trombonist with the Alex Welsh Band from 1965 to 1978. Simon Wills originally wanted to be a lute player, but was deflected to the trombone by a serious hand injury. After university he was principal trombonist of the Teatro Massimo in Palermo, then for many years a member of the London Symphony Orchestra. Few have played as active a role in Berklee's evolution into the internationally acclaimed institution it is today as Phil Wilson. Before joining the faculty in September 1965, Wilson had already made a name for himself as a cutting-edge trombonist and big band arranger, recording with Woody Herman, to mention a few. Dr. Wilson has been active nationally and internationally both as a soloist and as a member of the Continental Trombone Quartet, having given recitals and master classes at the Midwest Clinic in Chicago, the International Association of Jazz Educators National Conference in Los Angeles, the International Trombone Festivals in Brazil and China, the Eastern Trombone Workshop in Washington, D.C., the International College Music Society Conference in Spain, the International Vernacular Congress in Mexico, the Texas Band Masters Association Convention in San Antonio, and performances at various universities across the United States. Dr. Wilson is Associate Professor of Trombone at the University of Texas at El Paso..
Trombonist/Band Leader, The Ed Wilson Big Band, Terrigal, Australia - Most serious music lovers in Australia will know of Ed Wilson from his days with the legendary ''Daly/Wilson Big Band''. Gail Eugene Wilson is Professor of Trombone and Coordinator of Brass Studies at Arizona State University where he was the recipient of the Distinguished Teacher Award from the College of Fine Arts. Prior to his university teaching, Mr. Wilson taught in the public schools for six years. Steve Wilson studied trombone with Norm Fleming. Graduated with a BA in Molecular Biology from Humboldt State University in 1981 where I was active in the fledgling Jazz Big Band program under the direction of Gil Cline. Cambria resident since 1986. Performed with Louie Bellson, Tom Scott, to mention a few. Stephen Wilson is in his seventeenth season as the second trombone of the Atlanta Symphony Orchestra,. His previous positions include the Singapore Symphony, the Grant Park (Chicago) Symphony and the Chicago Festival Orchestra. After graduating from Berklee College of Music, Dennis Wilson began his professional career with Lionel Hampton as trombonist, arranger, and musical director. He has been a lead/solo trombonist for the Dizzy Gillespie Big Band, The New Tommy Dorsey Orchestra, and for ten years with Mr. William James "Count". After studying at the Guildhall School of Music and Drama in London, he was invited to join the Mahler Chamber Orchestra and toured extensively with them for 4 years. Tire of living life out of a suitcase, he resigned from the orchestra and have been working as a freelance professional ever since. Studied music at University of Utah and graduated from the Copenhagen Conservatory. Was a member of Bent Ronak's Big Band, Thad Jones Eclipse, Erling Kroner's Tentet, and Lars Togeby's Creme Fraiche. Joined the DRJO in 1969. In 1974 took up tuba as well and made it an integrated part of the orchestra. Dr. Phillip C. Wise has served on the faculty at Missouri Southern State since 1995. He teaches music education courses, supervises student teaching field experiences and serves as director of jazz studies. Prior to his appointment to the music faculty at MSSU, Dr. Wise taught for ten years in Iowa. Steven Witser dies at 48; L.A. Philharmonic's principal trombonist. 1984-1992 - music-lessons at the Municipal Conservatory of Braunschweig, principal instrument trombone, with Reinhard Feldmann (member of the Braunschweig Symphony Orchestra) as well as Helmut Seifert (member of NDR (Northern German Broadcasting Company) Symphony Orchestra at hannover). Gordon Wolfe has held the position of Associate Principal Trombone with the Toronto Symphony Orchestra since 2001. In addition to his work with the TSO, Gordon is Principal Trombone of the Lancaster Summer Festival Orchestra in Columbus, Ohio and is a founding member of the Central Park Brass. Ken Wolff began studying the trombone at age 12. Within 3 years, he was playing professionally throughout the San Francisco, CA area with Classical, Jazz, Dixie and Rock and Roll such as the Rich Martini Big Band, San Francisco Dixie Company, Choral Brass Quintet and others. Dr. Steve Wolfinbarger is an Associate Professor of Music at Western Michigan University, where he teaches trombone and conducting and is Chair of the School of Music's Brass and Percussion Area. He earned the Bachelor of Music Education degree from Evangel University in Springfield, Missouri. Graduate Student, Indiana University. Founding member, Momus Trombone Quartet. Daniel Wood has been playing the trombone for 8 years. He has participated in Tennessee All-State Orchestra, the Murfreesboro Youth Orchestra, and the Nashville Youth Symphony. Matt is an active performer, educator, and clinician in both the Austin and San Antonio areas. He regularly performs with the Austin City Brass and BrassFX quintets as well as with the Austinbones trombone quartet. In addition, Matt can be heard in a variety of jazz and rock bands throughout Central Texas. Dave is a remarkable trombonist who has performed all over the world -- His crisp tone and impeccible control can be appreciated on "The Lawyer" and on "WC Meadows". He has worked countless studio sessions and live performances. An extremely versatile musician, he has recorded Pop, Rock, Classical and many more styles. b. June 4, 1920 in Los Angeles, California - d. October 13, 2000 in Hawthorne, California - An extremely versatile trombone soloist, Britt Woodman led Duke Ellington's section in the '50s and was flexible enough to record with Charles Mingus and Miles Davis. Woodman had range, fire and the harmonic knowledge to handle sophisticated big band and swing dates, and Minges' futuristic, challenging arrangements. Woodman and Mingus were boyhood friends as well as longtime musical associates. Woodman played with Phil Moore and Les Hite in the '30s, then with Boyd Raeburn and Eddie Heywood in the mid-'40s before joining Lionel Hampton in 1946. Craig is the lead trombone and band manager for Paul Anka. Kanstul Custom Made 1662I Bass Trb with 3 interchangeable bells (brass, copper, bronze). Roger Wright has been a professional musician since 1965. His home base is San Diego California, but he has worked in Los Angeles, Palm Springs, Laughlin, and Las Vegas NV. 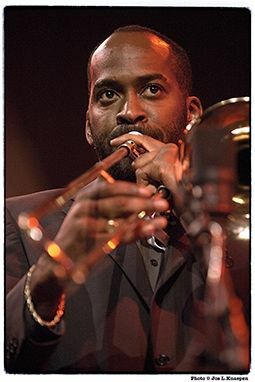 He has backed such entertainers as Tony Bennett, Frankie Laine, Natalie Cole, Mel Torme, Lou Rawls, Peggy Lee, Benny Hollman's band, and many more..
Douglas Wright, principal trombonist with the Minnesota Orchestra, was born and bred in the South. At an early age, he migrated north to attend the New England Conservatory of Music where he began a long relationship with his principal teacher Norman Bolter of the Boston Symphony Orchestra. Bron Wright currently serves as Principal of the Colorado Springs Philharmonic and 2nd with the Charleston Symphony Orchestra. He has performed with the Boston Symphony Orchestra, the Boston Pops, and the Boston Lyric Opera. He has recorded for Albany Records, Arsis Audio, Centaur Records. b. Jul. 29, 1907, New Orleans, LA, d. May 1973, Chicago, IL - Albert Wynn was best known for his work in the 1920s, although he survived and continued playing into the mid-'60s. Wynn grew up in Chicago, where he was based throughout most of his life. Early in his career, Wynn played in the Bluebird's Kids Band and toured with Ma Rainey.